AUBURN, ALA. – No. 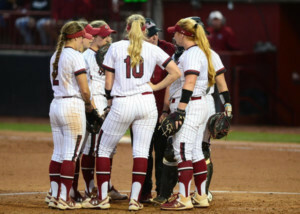 16 South Carolina softball tied the game in the top of the seventh but dropped a heartbreaking 5-4 series opener at No. 12 Auburn on Friday night at Jane B. Moore Field. Kennedy Clark plated two in the seventh with a single to the outfield but a Carolina error and Tiger single in the bottom seventh helped Auburn secure the walk-off win. South Carolina fought back from a four-run deficit through four innings and out-hit its opponent 11-6 but it wasn’t enough as Auburn improved to 9-4 in SEC play while the Gamecocks moved to 5-10. Carolina notably loaded the bases in the top of the seventh with three-straight hits off the bat of freshmen at the bottom of the lineup on its way to tying the game three batters later. SEC Pitcher of the Week, Dixie Raley (10-3), went the distance in the circle for the Gamecocks. South Carolina (29-12, 5-10 SEC) struggled in the field in the first as two errors and a trio of hits helped Auburn take a 3-0 lead through one. The Tigers later extend the lead to 4-0 with a solo homer in the bottom of the third. From there, the Gamecocks found some momentum after the two squads traded scoreless frames in the fourth. Jordan Fabian, a freshman, blasted her first-career home run in the top of the fifth to score two and cut the deficit in half at 4-2 heading to the sixth. After a scoreless sixth, Carolina continued to put pressure on the Tigers as it looked to tie the contest. A trio of hits off the bats of freshmen Madison Owens, Karly Heath and Fabian started the seventh and loaded the bases with no outs heading to the top of the lineup. Eventually it was time for the upperclassmen to take over as Clark sent a ball to the outfield to score two and tie things at 4-4 heading to the bottom frame. Carolina’s third error of the night started the Auburn seventh off with a runner on third with no outs before the Tigers earned the 5-4 walk-off victory in the series opener the next at bat. The Gamecocks had 11 hits on the night as Fabian posted her first career 3-for-3 night at the plate with two RBI. Clark went 2-for-4 with two RBI while Mackenzie Boesel went 2-for-4, as well. Cayla Drotar, Lauren Stewart and Owens also added hits. Raley went the distance allowing just six hits with five strikeouts. Jordan Fabian blasted her first-career homer in the top of the fifth in the series opener on Friday night. She is the 12th Gamecock with a home run this season while it was the team’s 51st of the year. Speaking of Fabian, she went 3-for-3 tonight marking her first career three-hit game. She became the seventh Carolina hitter with three or more hits in a game this season. Mackenzie Boesel recorded two hits tonight, improving her current hit streak to nine games. That mark is just one off from trying her season high. She has also recorded a hit in seven-consecutive SEC games. Boesel along with Kennedy Clark has reached base in 10-straight games overall. In the top of the seventh, Carolina had three-straight freshmen (Madison Owens, Karly Heath and Jordan Fabian) record hits, marking the first time this year that first-year players have recorded three-consecutive hits in a game. South Carolina moved to 0-5 in SEC Friday night games following tonight’s contest at Auburn.